Today’s board game is Machi Koro by, Masao Suganuma, is a family friendly, fast- paced, card drafting, dice rolling games. It’s designed for two to four players and the aim of the game is to construct four key buildings in your town first. 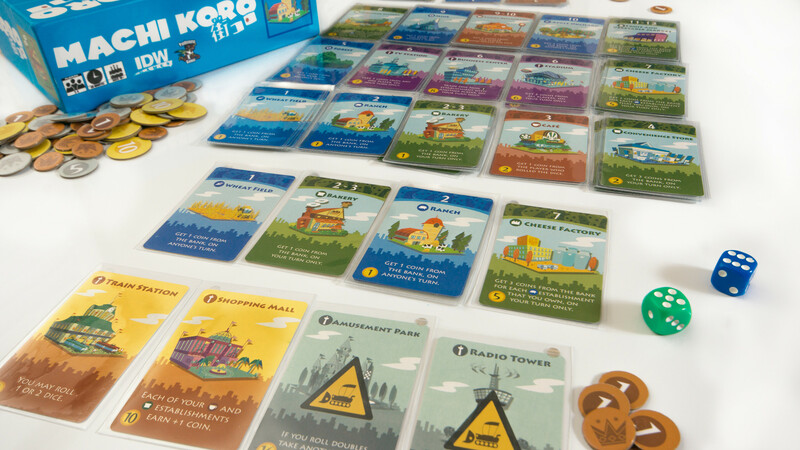 Machi Koro sees the players take on the roles of a newly elected Mayor. You have to fulfil the demands of your town’s citizens, taking the town from a few basic buildings, to a thriving city. The citizens have some pretty big demands: They want you to build up the towns economy and production so that you can construct four major landmarks that any city will need. You will need to collect income from developments, build public works, and steal from your neighbors’ coffers in order to achieve victory. On your turn, each player rolls one or two dice. If the sum of the dice rolled matches the number of a building that a player owns, he gets the effect of that building; in some cases opponents will also benefit from your die (just as you can benefit from theirs). Then, with money in hand a player can build a landmark or a new building, ideally adding to the wealth of his city on future turns. The first player to construct all of his landmarks wins! So that’s Machi Koro in a nutshell, but what’s it like to play? Well I’ve played this game about a dozen times now, and I think it’s a lot of fun. It’s a quick game to grasp, which makes it easy to introduce new players. The game also relies on very familiar mechanics, that of deck building from a common pool, and dice rolling to acquire resources. The game moves at a quick pace. Turns don’t take too long, and the mechanics often allow you to benefit during your opponent’s turns, which is always nice. I really hate games where you just have to sit there doing nothing whilst the other players take their turns. The victory conditions are quite easy to meet, so the game does feel quite quick to reach the end. The game can be played with up to four players, and as few as two. I found the two player version of the game a little stale. With two players, you can pretty much just pick the cards you want to buy without fear of missing out, and having only one other player devalues the cards that allow you to steal from others when they roll a certain number. This makes the two player version a little simple, and a little slower, with less interaction. During the last few two player games I’ve had, me and my opponent had worked out such efficient strategies that we basically raced to see who could buy the one or two efficient cards first, and whoever did generally won. The four player game is much more tactical, much more conniving, and a whole lot more fun. If the name didn’t give it away, the game is Japanese and as such has a beautiful aesthetic to it. The card art is gloriously cartoony, and despite their not being many components, when all the different buildings are laid out it does look really nice. The other components are typical card tokens, and instruction books, all of which are nicely printed, and high quality. Machi Koro does have an expansion, but I’m yet to try it. From reading about it online, the expansion adds new building types, and a new mechanic that I imagine adds a layer of depth to what’s on offer in the core box. Speaking of the core box, the game is pretty cheap. I didn’t feel like it wasn’t worth the cost, and I enjoy having a few games I can get out that are quick to play and require very little thinking. This to me is a great game for winding down a board game evening, or if you have kids around who want to play stuff, but aren’t old enough for the really complex games that take hours to play. Overall I think Machi Koro is a charming little game, with great visuals, simple rules, and a short time commitment. It’s the perfect game to get your kids into the world of board games too. There are definitely better games out there in this genre, but I think for the cost, and the unique art style, this game is worth adding to your collection. If you know someone who has it though, maybe don’t bother buying it yourself. Thanks for reading, see you next week.